Most political pundits believe that the November 2014 elections spell serious trouble for Democrats. Not so fast. Despite their blustering for the benefit of their friends in the apparatchik press, the party appears to have conceded that it can't regain a majority in the House of Representatives. One might therefore think that Republicans have a chance of greatly expanding their current 33-seat House advantage. That doesn't seem likely. It's difficult to overestimate how much harm supposedly helpful GOP gerrymandering in certain red states has done in the current situation. For example, in Ohio, the state's GOP-dominated apportionment board "cleverly" carved out four heavy-majority Democrat districts for elections beginning in 2012. That year, the Democrats who even had opposition achieved victory margins averaging 46 percent. The fourth ran unopposed. The odds that a real or concocted scandal or controversy might cause an incumbent Buckeye State Republican to lose to a Democrat are far greater than the likelihood that a wave election could unseat an incumbent Democrat. Perhaps opportunities exist in aggressively gerrymandered blue states. California, Illinois, and New York would seem to be candidates to yield pickups in certain marginally Democratic districts. However, the challenges are formidable. Most obviously, there are the powers and advantages of incumbency. Additionally, local journalists appear on the whole to have become every bit as hostile to anyone who demonstrates a whiff of conservatism and its values as the establishment press in D.C. A GOP establishment which either hasn't figured out how to or doesn't have the courage to consistently go over the media's heads doesn't help. Speaker John Boehner, himself an obstacle to conducting ideology-based House elections, would probably be (but shouldn't be) thrilled with a net pickup of 15 seats, which would still leave the GOP miles away from a 290-seat veto-proof majority. Washington's Democratic campaign generals are likely to divert campaign resources towards defending their current 55-45 Senate caucus majority. Of the 36 Senate seats up for grabs, including three special elections for unexpired terms, Democrats currently hold 21. 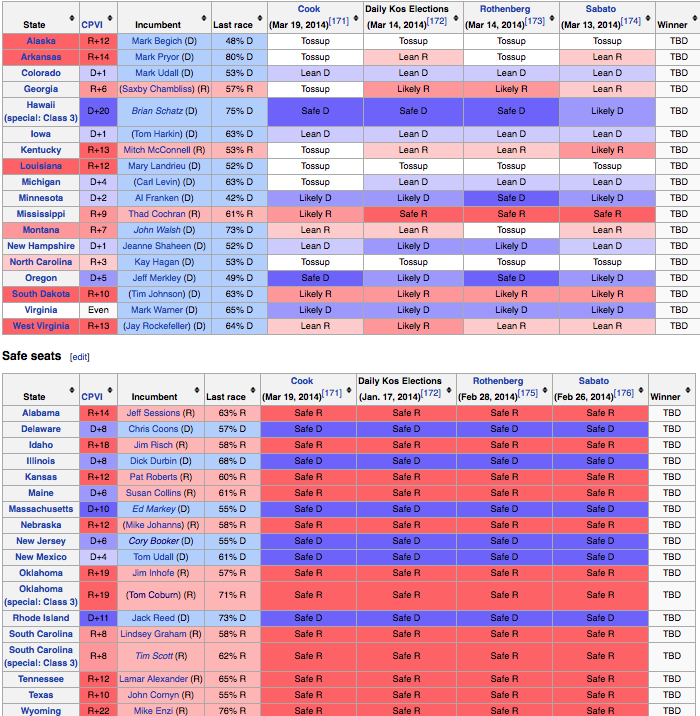 All 15 GOP-held seats are currently consensus polling as holds. The same polls, all of which tend to oversample Democrats, especially in non-presidential elections, identify eight currently Democrat-held seats as clearly vulnerable, and only six as supposedly safe. To achieve an old-fashioned filibuster-proof majority of 60 which reflects how the Senate was run until Senate Majority Leader Harry Reid changed the rules last year, Republicans would have to win all 15 non-safe Democrat-held Senate seats while losing none of their own. A miraculous run of the entire table would still leave them one vote shy of a 67-seat veto-proof majority. President Barack Obama, whose performance is for all practical purposes the one and only reason for the vulnerability of the senators on his team, is already whining that off-year elections aren't a "representative cross-section of America." No, they're a better representation of the will of informed people who care about the future direction of the country, and in this case the continued existence of its Constitution-based government.